Data is important. It helps us to guide our decisions based on facts –not just gut instinct. Lately, this data from eMarketer (thanks Scott Monty) has been floating around the web, and I want to add my own thoughts. Having conducted similar trust research, or seen the data from others, much of this is confirmation to what we already know. I do however want to provide my additional insights to how I interpret the findings. Trust is highest with people you actually know. I averaged 64, 64, 45 to be 57.66% across the various data sources above. Brands that produce their own content (owned) 36, 41, 32, 26 averaged at 33.75% positive. Far less than the 57% of people that you know clearly indicate that consumers trust brand far less, but more so from people that they don’t know. This leads to conclude that while brands may be telling consumers the positive aspects of a product, it’s more likely to be based on facts. Similarly those that are ‘independents’ (or people you may not know) the trust goes down significantly. 37, 25, 21, for an average of 27.66%. Those that you don’t know are about half as trusted as those you do. Therefore brands focusing on social media should instead but areas of focus on harnessing the social graph –not just mindless social media from the masses. Brands should focus on social marketing that harnesses the “social graph” which is getting friend to share with their own friends. By developing advocacy programs and focus on word of mouth marketing, brands can increase marketing and sales margins by getting customers to do the work for them. See my article on Forbes on advocacy programs, or see how Zuberance encourages WOM, as well as aggregate your customers social graph on your own web proprieties using Gigya, Janrain, Disqus, and Echo. At the very basic level, encourage sharing tools like Sharethis, Addthis to the mix. Clearly brands should continue to produce their own ‘owned’ content in social media, as there’s still a degree of trust, but balance out this inventory with a greater degree of ‘earned’. Yet rather than try to sway the masses that your product is the best, publish factual information about products and services, and retweet, repeat, and echo back what customers are saying. 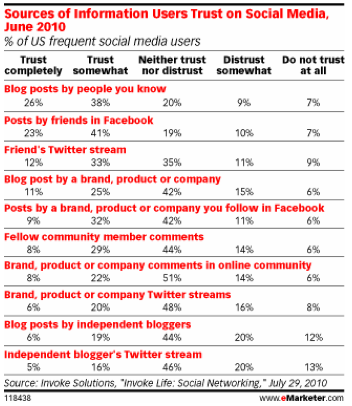 Focus less on triggering word of mouth of independents, while it will happen naturally, this data is indicating that inviting people to share with their friends, may yield a greater degree of trust. I hope you found this helpful, I gave my additional analysis and insight to the eMarketer data, as well as suggestions from brands. This data is confirmation of data I’ve seen from a variety of other sources.